Rabbi Asher Hecht, left, hands Dr. Eron Manusov a box of matzah bread in the University of Texas Rio Grande Valley Tuesday, March 27, 2018, in Edinburg. EDINBURG — Janis Feldman, 69, associate professor of social work at The University of Texas Rio Grande Valley, remembers looking for the Afikoman (the hidden matzah) and participating in other Passover festivities as a young girl. Matzah is a thin, crunchy form of unleavened bread that’s enjoyed along with other staple dishes during the Jewish Passover observance. 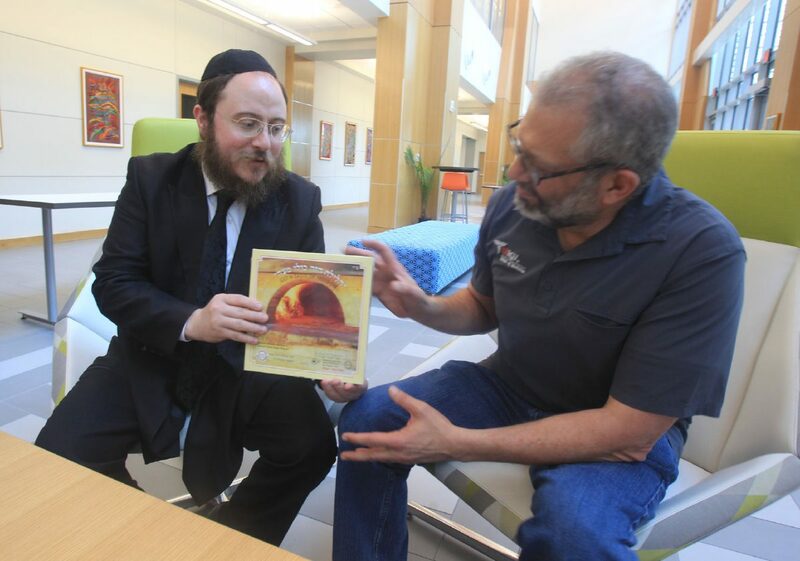 Feldman was in the UTRGV Medical Education Building receiving a box of shmurah matzah from Rabbi Asher Hecht of Chabad Rio Grande Valley, as she and a group of faculty exchanged stories. Shmurah matzah is unique in that it’s watched from the day the grain was harvested to the day the bread was packaged to make sure it made no contact with water. Other, store-bought, kosher-certified matzah found in local grocery stores only guarantee that the bread was prepared in the required 18 minutes. Passover celebrates the Israelites’ freedom from slavery in Egypt. They left so quickly that their bread did not have time to leaven, which is why matzah is enjoyed at Passover. “The universal meaning of Passover is that it’s time for redemption; you can actually liberate yourself … from the confines and limitation of life,” Hecht said. Originally from New York, Hecht said while he was growing up, the resources to express his faith “in its highest, fullest standard,” were readily available. In the Valley, sometimes those resources are lacking, he said. Hecht works to “fill those gaps” in the community. This Passover, he’s doing that by distributing shmurah matzah to the Jewish community throughout the Valley. Per tradition, once they find the Afikoman (the hidden matzah), the children win a prize. In Feldman’s house, that was a dollar. On Passover, it’s custom for the youngest children to ask questions about the holiday. Though, that’s not to say the two cultures don’t overlap, she said. “Both cultures hold on strongly to traditions,” said Eron Manusov, 60, a clinical associate professor at the UTRGV School of Medicine who was also present at the distribution on Tuesday. Manusov, like Feldman, attends Chabad RGV with Hecht. Eventually, Feldman, Manusov and Hecht all left the building clenching their boxes of shmurah matzah, ready to celebrate the holiday.